Krishna is a six year old boy that first came to BCMF one year ago after being diagnosed with cardiac disease. His family is ethnically Nepali and live in Kachin State. However, in 2011 fighting broke out in their village between the Burmese Army and the Kachin Independence Army. Fighting between the two armed groups restarted in June 2011 after a 17-year-old ceasefire broke down. Some estimate that the conflict resulted in the displacement of over 100,000 civilians. According to news reports, fighting broke out as a result of the Burmese central government attempting to take control of Kachin Independence Army controlled areas and attempts to secure areas around lucrative energy projects in Kachin and Shan state, the majority of which are backed by the Chinese government. To escape the fighting, Krishna and his family had to relocate to a camp for internally displaced persons (IDP). When Krishna was three years old, his parents noticed that he was frequently tired, his fingers and toes were often blue, he was short of breath, and could not walk more than 10 steps without becoming fatigued. His father said he often suffered seizures as well and his parents constantly had to keep an eye on him. (Seizures are not uncommon in children with cardiac disease during periods when there is not enough oxygen). Krishna’s father took him to Myitkyina, the capital of Kachin State. There, they saw a pediatrician who told them that they should wait until Krishna was at least 5 years old and then take him for investigation and treatment in a larger city such as Rangoon or Mandalay. 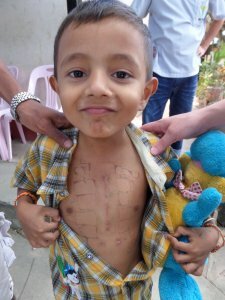 When he turned 5, his father took him to Mandalay and the cardiologist there told him that Krishna needed surgery and the cost of the surgery alone would be approximately 7,000,000 kyat ($7,200 USD). When considering the full costs of investigation, follow-up, medication, etc. the total cost would be closer to 10,000,000 kyat ($10,300 USD). Krishna’s father knew he could never hope to afford the cost of surgery for his son, so he returned home. He called his sister who works in Bangkok and told her about Krishna’s health problems. She encouraged them to come to Thailand for treatment and arranged to cover the costs of their passports and visa fees. However, when Krishna and his father visited a hospital in Bangkok, they were told the surgery would cost 200,000 baht ($6,400 USD). Originally, Krishna’s aunt hoped that Krishna could receive reduced cost medical treatment under Thailand’s 30 baht health insurance system. (The government of Thailand has established a universal health coverage scheme that allows Thai citizens to access health care at local hospitals at a rate of 30 baht per consultation). However, the hospital informed them that because they were not Thai citizens they were not entitled to health coverage under the Thai health insurance system and they would have to pay the full costs of Krishna’s surgery out of pocket. Later, Krishna’s aunt met a BCMF staff person in Bangkok who suggested that Krishna might qualify for the program and encouraged her to follow-up with BCMF staff in Mae Sot. Two days later, she traveled from Bangkok to the Mae Tao Clinic in Mae Sot along with Krishna and his father. There, medics confirmed his diagnosis of cardiac disease and BCMF staff enrolled him in the program. Krishna went to Chiang Mai a total of three times. The first time was for an initial investigation and doctors put Krishna on heart medication to help stabilize his condition. He later returned to Chiang Mai for a follow-up appointment to monitor his condition and to determine that he was on the right dose of medication. Krishna then went to Chiang Mai a third time in October 2013 for surgery. Krishna has Tetralogy of Fallot (TOF), a congenital heart defect which includes four anatomical abnormalities of the heart. He underwent a surgery known as ‘total correction’ to correct all four abnormalities. Krishna’s father said that their overall experience in Chiang Mai was good. He was especially impressed that they faced no discrimination from the doctors or nurses; he said that all of the patients were treated equally well regardless of where they were from. He noted that this is not the case in Burma and that ethnic minorities are not always treated as well in Burmese Hospitals. Krishna’s father also said that he asked the cardiologist in Mandalay to provide them with a referral letter that they could take with them when they sought treatment in Thailand. The doctor charged them 6,000 kyat for a letter that only included one or two sentences about Krishna’s diagnosis. However, when they got to Thailand, none of the staff in the Thai hospitals could read the doctor’s handwriting. By contrast, in Thailand, he said the doctors and nurses explained everything about Krishna’s diagnosis and treatment clearly. Following the surgery, Krishna’s father says his condition is much better. He says that Krishna has more energy and now he can play without getting fatigued. Before the surgery, he could not walk more than 10 steps without getting tired. In fact, now he enjoys playing so much that his father has a hard time getting him to stop playing. When they were scheduled to come to BCMF for their post-operative interview, Krishna’s father had a hard time convincing him to stop running around so they could go to the interview. His father had a huge smile on his face as he told BCMF staff this story; clearly he is very happy that Krishna now has the energy to play like a normal boy. Throughout the interview, Krishna played with a stuffed dinosaur given to him by BCMF staff and played computer games on one of our phones. Krishna’s father said he is very grateful and thankful to the staff of BCMF. At first, he thought he would not be able to get his son treatment because he could never have afforded the cost of the surgery in Mandalay. He said that even when he was working before they relocated to the IDP camp, he would not have been able to earn enough money in a lifetime to cover the cost of the surgery. He says he cannot find words to express his gratitude. He is so happy and before coming to BCMF, he could not have imagined how he would ever find a way to get his son treatment. He says he wishes the donors of BCMF happiness and hopes that they will be able to continue to support patients like Krishna. Krishna’s family has been very stressed, both about their living situation in the IDP camp and Krishna’s health. However, now that his son is well, he says he no longer feels stressed even though he has to return to the IPD camp. He feels confident that he can start a new business when they are able to leave the camp, but his son’s health is the most important thing of all.